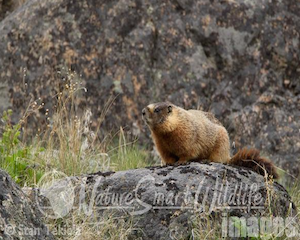 In this week’s NatureSmart column, Stan Tekiela talks about yellow-bellied marmots. Yes, I admit it, I am a nut about nature. Not just the big amazing birds and animals, such as eagles and bears, but the small critters too. I realized this (again) on my recent trip to Colorado. I had stopped along a steep mountain road and just below me were several Yellow-bellied Marmots (Marmota flaviventris). You might be more familiar with their eastern cousin, the Woodchuck. Both are a type of ground squirrel that eats plants for a living and hibernates all winter. Well, anyway, there I was filming these chubby, rock-scampering squirrels; I was thrilled to spend many hours just watching and capturing their behaviors, despite the cold, biting wind roaring up from the valley below. The marmots didn’t seem to mind the wind at all. I was feeling lucky to find these guys because it’s estimated that they spend 80 percent of their life underground. Yellow-bellied Marmots are a thick-bodied, shorted-legged animal with a grizzled appearance. They have tiny ears and a blunt muzzle with a distinctive white mark around the nose and mouth. Males are usually larger than females. They live in incredibly harsh environments often high up in the mountains in rock outcroppings. As a type of ground squirrel, they live in burrows underground. They dig burrows upwards of 15 to 30 feet long, with chambers at the ends. The entrance is usually located under a very large rock for added protection. The burrow is usually less than 10 inches wide, with a fan of dirt extending out from the entrance. While watching and capturing images of these Yellow-bellies, I noticed that two were comfortable with each other and hanging out together. Not 50 feet away, a darker and larger marmot was scrambling around the rocks. Each marmot would scramble onto a prominent rock and look out across the mountain valley. They are watchful for predators, such as Mountain lions, bears, and Golden Eagles. From where I was sitting I could see a Golden Eagle hunting on a nearby mountain. The winds were so strong that the eagle was just hanging in the air and not moving. It didn’t flap its wings at all, but it was sing its powerful eyes to scan the ground in search of a unsuspecting marmot. Meanwhile, back on the mountain where I was filming the marmots, the large darker marmot was slowly moving across the rock field, occasionally stopping at a prominent rock to look around. The pair of marmots that were nearby gave a few alarm whistle calls as the intruder (most likely male) moved closer. 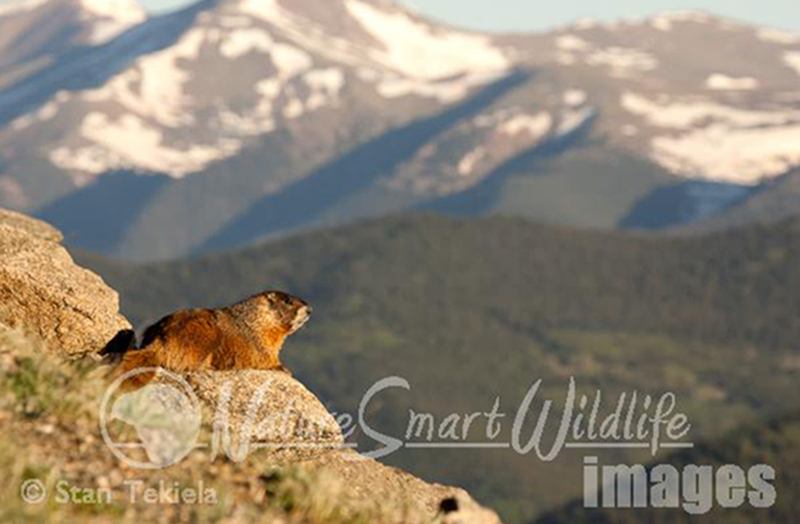 Marmots are sometimes called whistle-pigs, due to this loud whistle call. At some point the larger marmot approached the pair. I made sure I was in a good position to capture any action that might happen. It looked like something might transpire between the marmots. Soon the larger neighbor was face to face with one of the pair. Then it happened. 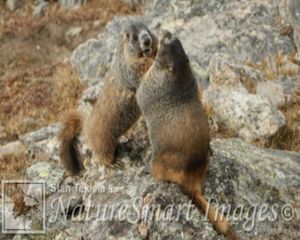 The two marmots started fighting or sparring. They stood up on their hind legs and grabbed each other; using their large upper and lower incisor teeth, they started biting. Because the teeth are long, sharp, and capable of delivering a nasty bite, much of what they were doing was trying to avoid being chomped on by the other.